The Bluetooth Module provides a safe and convenient way to unlock doors using a Bluetooth-enabled smart phone or tablet with the 2N Mobile Key application. 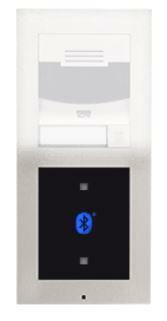 Integrated Bluetooth technology for the 2N® IP Verso and 2N® Access Unit. The Bluetooth module provides a safe and convenient way to unlock doors using smart phones or tablets with the 2N® Mobile Key application. There are several modes of operation being released. 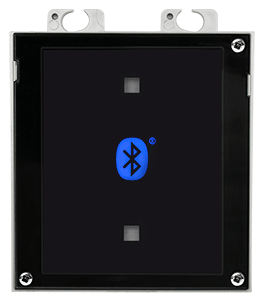 The Bluetooth Module can be used either within the same frame as the Main Units, individually in it’s own frame, or with other Additional Function Modules in a multiple-Module Frame.